The photograph shows the building in the outskirts of Naxxar, which partially collapsed last month after heavy rains, as it stood in the summer of 2009. Clearly, this is a structure of significant architectural and possibly historical importance. Sited along the rural stretch of Main Street, the ancient Strada Reale linking Lija and Birkirkara with Naxxar, it also appears to possess an extensive estate. The building’s plain yet imposing elevations suggest late 16th, early 17th century origins. In The Building of Malta 1530-1798 (Tiranti, 1967), J. Quentin Hughes attributes such a kind of construction to this period stating that “many houses were built in the country and in the villages which show the characteristics seen in Valletta palaces. While the country houses were in character more austere and often semi-fortified, and the country buildings more modest in size and decoration...” At the upper floor or indeed piano nobile, the grand balconies were built to exploit the extensive views of central and southern Malta. While anyone with historical information about this place should come forward, the authorities ought at the same time to take all necessary measures to prevent its further deterioration. In the United Kingdom, the government, through bodies like English Heritage and the National Trust, purchases properties of national historical importance and preserves them for posterity. 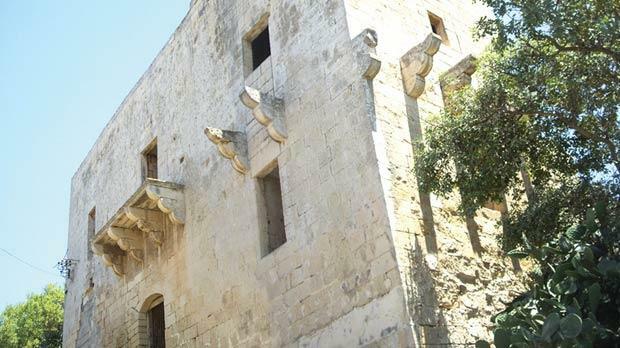 Similar action should be taken on other historically valuable sites such as Casa Ippolita in Birżebbuġa, the so-called Dar tal-Barunessa at San Anard, l/o Żabbar and the Razzett tax-Xitan at Ta’ Pennellu in Mellieħa, all of which are crumbling fast and at risk of being lost forever.